When you decided to start your own home service business, it probably wasn’t because you love to make schedules. In fact, the logistics of scheduling likely weren’t on your mind much at all until you made your first few hires. By now you’ve probably realized that technician scheduling is one of the most important tasks you handle on a regular basis. After all, an organized, well-thought-out schedule allows you to maximize bookings and service more customers. As your team expands further, your ability to make smart scheduling decisions will continue to play a huge factor in your success as a business owner. So, how can you do it better? Let’s take a look! What Are the Biggest Challenges of Technician Scheduling? Good question. In theory, technician scheduling should be quick and easy to take care of – but that’s rarely the case. Here are some of the most common problems home service business owners face with technician scheduling. Unproductive Gaps in Your Schedule: This is more than a case of simply under-booking. If your schedule isn’t optimized to fit in as many appointment slots as possible, you’ll have awkward gaps that are too short to squeeze in a maintenance call but long enough to hurt your revenue. Having unproductive gaps in your schedule means you’re not billing as many hours as you could be – which eats into your potential earnings. In fact, according to studies by Bain Consulting, poor scheduling decisions can cost you up to 50-60% of your revenue. Scheduling Conflicts: On the other end of the spectrum, you can also run into problems if your schedule is too tightly packed. This type of overbooking can result in issues like technicians showing up late to appointments, accidentally sending two technicians to complete the same job, or expecting a technician to get across town faster than possible during high traffic times. Lost Business and Revenue: Disorganized or short-sighted technician scheduling can cost you revenue as well as potential customers. As a small business, you can’t afford for your technicians to waste time driving back and forth across town in between appointments. Or to have gaps in your schedule, no-show customers, or techs who show up late to appointments – especially because 64% of customers won’t rehire a service company that’s an hour late to an appointment. If you want to make technician scheduling as easy and efficient as possible, you need to think about your priorities and plan accordingly. For instance, do you want to schedule by location to save on gas and minimize travel time? Or would you rather assign specific jobs to specific technicians based on their skills? Let’s take a look at how you can simplify your technician scheduling practices to maximize revenue, boost customer satisfaction, and keep your techs happy, too. One simple way to make scheduling decisions is by assigning technicians to specific jobs based on their experience level and skill set. This works best if you’ve got a larger team or technicians with varied skills and expertise. For instance, if any of your technicians specialize in one area of your field, it makes sense to ‘save’ their skills for jobs that require their expertise. Otherwise, you’ll lose out on that business if your experts are all booked up with routine maintenance – something that could be handled by a generalist or more junior tech. If it doesn’t make sense for your industry or team to schedule by skill set, a good alternative is technician scheduling based on location. 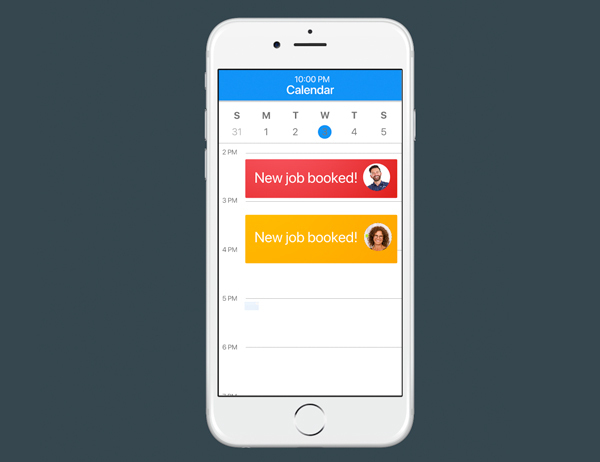 Scheduling jobs based on location is more efficient than booking work all over town to fill your schedule. That is, it’s better to cater to one region or zone on a given day than to have your technicians driving all over the place, wasting gas and time in between jobs. For example, on Mondays, Wednesdays, and Fridays, you might only book jobs in service zones one and two. On Tuesdays, Thursdays, and Saturdays, you might focus on servicing zones three and four. If your availability doesn’t line up with your customers’ expectations, you’ll have a hard time filling your schedule even if customers want to book appointments. For example, if you limit your technician scheduling to 9-5 on weekdays, you’re cutting yourself off from a huge range of potential customers who have to be at work during that time. Considering extending your business hours to accommodate customers who work during the day and can’t take time off to let you into their home for their service appointment. By offering a more flexible schedule that includes early mornings, evenings, and weekends, you’re making it easier for customers to find appointment times that fit into their busy lives. You can streamline your scheduling process further with the help of home service management software. Technician scheduling software allows you to easily manage your call schedule, maximize bookings, and avoid scheduling conflicts. Home service business software like Housecall Pro streamlines internal communication, which prevents problems like sending two techs to the same job site and ensures your techs are always on time for appointments. Plus, a real-time dispatch system allows your technicians to receive alerts about upcoming jobs, update their availability, and mark work completed right from the job site. Your home service management software can also help you avoid last minute cancellations and no-shows by sending automated service reminders to customers with upcoming appointments. If you schedule out maintenance or seasonal work in advance, there’s a good chance some of your customers will forget by the time their appointment date rolls around. So, rather than dispatching technicians to job sites only to find that no one is home, use your technician scheduling software to send out automated service reminders in the days leading up to an appointment. Encourage more customers to book with you by making it easy to view your calendar and book a time slot online. A digital booking system that displays your availability allows customers to choose a time that’s most convenient for them. It’s also a good idea to ask for customer feedback about your scheduling practices. For instance, do your customers feel that it’s easy to book an appointment that fits into their schedule? You can use customer input to improve how you handle technician scheduling going forward. As a business owner, there are plenty of things you could be spending time on besides technician scheduling. But hey, it comes with the territory – if you want to run a profitable home services business, you need an efficient scheduling strategy. The key is to find the right process and tools that make managing your technician scheduling as fast and simple as possible. Home service business management software like Housecall Pro makes it easier than ever to book more appointments and maximize productivity. Want an easier way to manage your home service business and technician scheduling? Book your live demo today to find out how Housecall Pro can make your scheduling more efficient, so your business can be more profitable.